Here in CT we are in the heat of the summer season. The temperatures have been in the 80’s and the humidity has been in the 90’s. To say it’s been Hot and Humid would be an understatement. But it’s Seasonal. The temperatures will drop and the humidity will go down. Tis the Season – NOT for Fear of Public Speaking! Fear of Public Speaking is nonseasonal. Many people experience this FEAR. This FEAR can be triggered at different times for different people. Are You triggered by any of the below? Giving a BIG presentation to a BIG group of people? Giving a SMALL report to a SMAll group of people at a work meeting or club meeting? Introducing yourself in a group? Approaching someone you have a romantic interest in? Blushing or just plain Red in the Face. Trembling or shaking hands, body, or voice. Racing heart or tightness in chest. you’re not in a romantic relationship? you’re staying quiet or hiding in the background? you’re drinking to calm your nerves before socializing? Yes, Help is available in a variety of ways. When John first came to me he expressed his need for help with anxiety in general and speaking in front of a group of people that he knew and that he was socially friendly with. True story! John always felt a knot in his stomach. He worried about what other people would think. Note: I asked if he was psychic, if somehow he knew what other people were thinking. No, he said he is not psychic. Oh and by the way, it never occurred to him that maybe they weren’t even thinking about him because they had other things to think about or needed to think about or they just didn’t think about thinking about him. He would fumble over his words. Note: YIKES!, I fumble over my words! Should I have Fear of Public Speaking?!!! He felt all eyes were on him. Note: If you’re presenting it’s a good thing for all eyes to be on you! It kinda means they’re listening to you or they are at least pretending to listen to you while they are making a mental list of what they have to do after your presentation. He used to wonder to himself; How will I even stand up? Note: He didn’t even have to stand up to present! He was worried about something he didn’t even have to do! Please, focus on a real problem? We did a lot of tapping in those first couple sessions to calm John’s system down and to stop his system from going into red alert at the mere thought of those things that created his Fear. We were able to get the knot in his stomach to loosen up a bit initially by using some Neuro-Linguistic Programming Techniques. In a short time the knot completely disappeared. Hypnosis allowed John to see himself calmly presenting and to feel the calm as he presented. This was now stored in his memory cells as truly having taken place which then allowed the memory cells to replicate off of those experiences he had in hypnosis. Remember, the brain does not know what is real or imagined. Note: We imagine the worse. We have a bad dream. The brain acts that It Really Happened, so our emotions go there. Last time John came in I put on my detective cap and took some notes. The size of the group no longer matters. He no longer stresses way ahead of time. He doesn’t even think about it ahead of time! He’s not so worried about what other people think. He is no longer hijacked by his primitive brain. Note: There are no lions, tigers or bears, oh my! 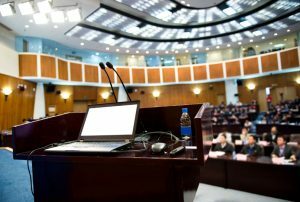 Aren’t you tired of that unwanted companion of yours known as Glossophobia Fear of Public Speaking? Call Joann Dunsing at 203-907-7710 or click the link to contact me now to Help You Find A New Companion known as, Relief.